In 2011, after the unemployment rate doubled from 5 to 10 percent, the housing market crashed and the stock market took a nose dive, we took an early look at the impact of those economic contractions on teacher employment and found that, while there were isolated layoffs of significance (mostly in California), teachers had been relatively protected from job loss. On average, teachers continued to get raises post-recession, but the increases were one-third to one-half of what they were at the start of the recession. In 80 percent of the districts studied (33 out of 41), teachers had a total pay freeze or pay cut in at least one of the school years between 2008-09 and 2011-12. 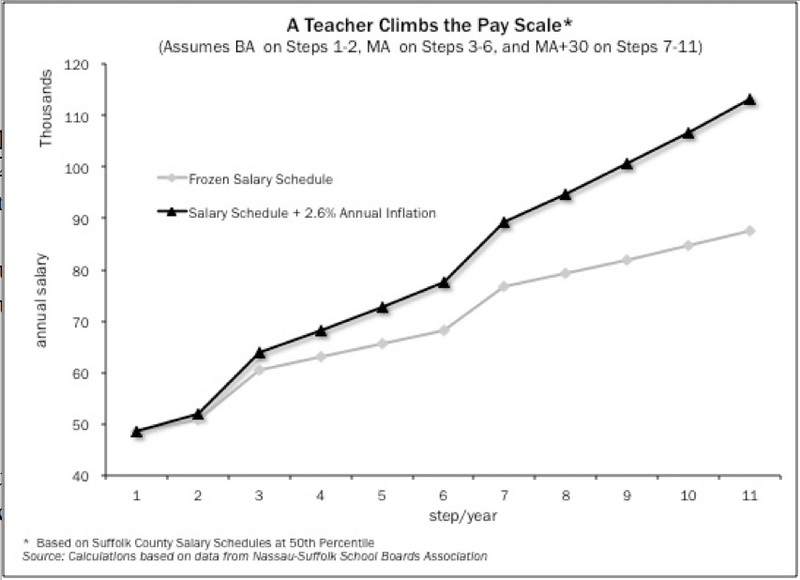 95 percent of the districts (39 out of 41) froze or cut at least one component of scheduled teacher raises (step increases or annual adjustments) at some point over the four years. Of the forty-one districts in our sample, Chicago Public Schools had the highest average raise over the four years at 6.5 percent. 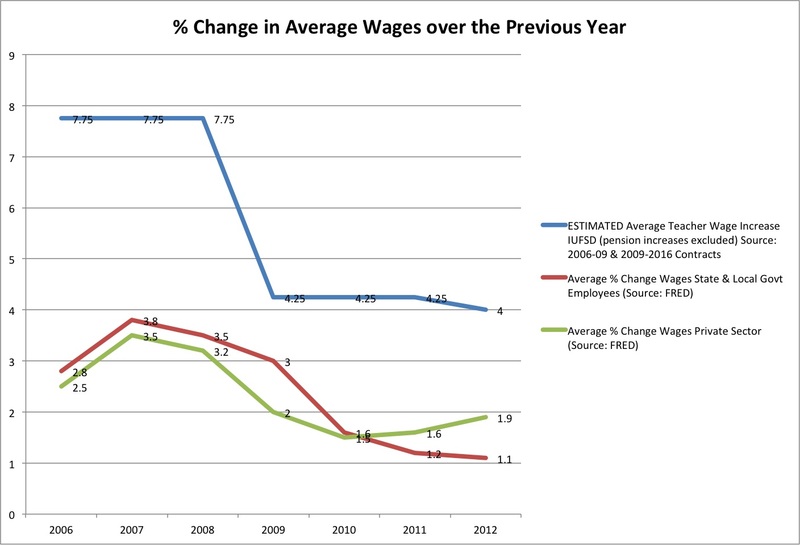 “Sticky wages” are the reason for unemployment during recessions and depressions. In recessions, money and wealth fall, but wages stay the same or even increase. Thus some people must lose their jobs altogether so that others can keep the salaries they had before. Schedule “E” will be in effect from July 1, 2013 until June 30, 2014, increase of 1.75%. In addition, all Association members shall be ineligible to receive step increment in the 2013-2014 school year until February 1, 2014. Does this clause mean that teachers will receive only half of the full step increase, or that payment of the full increase is delayed for several months? UPDATE: I’ve heard from someone who should know that next year teachers receive half of the full step increase. Here are the raises a hypothetical IUFSD teacher who began working in the district last fall (in Column 3) would receive over the next three years of the contract. By way of comparison, the highest raise an employee of IBM receives is 3.5%, and those raises are based in merit. 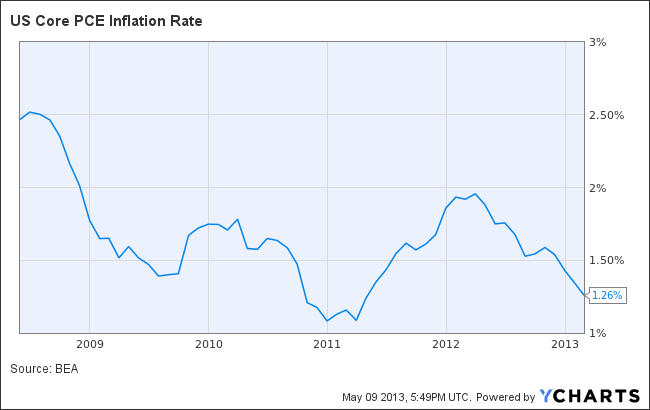 Core PCE inflation is currently at 1.26%. 2013-2014 …2 $60,051 -1733 ?? Step and lane raises are protected by the Triborough Amendment. The district is required by law to continue paying step-and-lane raises when the contract expires, and that is what we have done. For the district to reduce step-and-lane raises, the union would have to make a concession. Salary-schedule raises are not protected by the Triborough Amendment: salary-schedule raises expire when the contract expires. For the union to continue to receive salary-schedule raises in addition to step, lane, and career-increment raises, the district must make a concession. The district made this concession in negotiating the most recent contract. Salary-schedule raises begin again next school year. 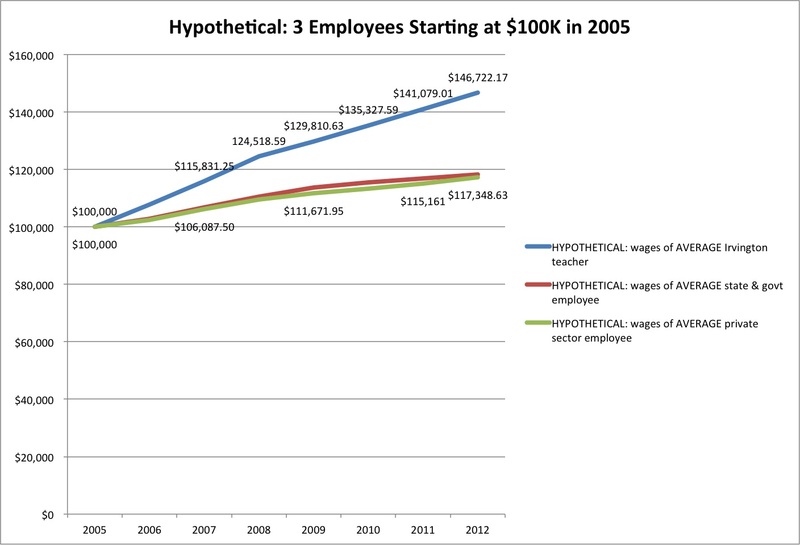 We don’t have to pay this third type of raise at all. Nothing in the law compels us to do so, and nowhere in the private sector do employees receive three four different guaranteed raises regardless of performance or the state of the economy. 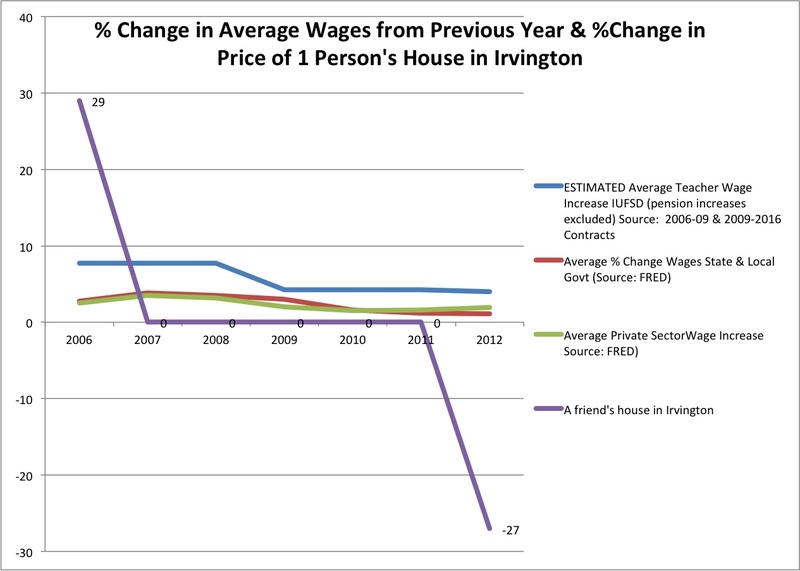 The simple truth is that IUFSD contracts break the cap, and “wages” have never been frozen. Salary-schedule raises expired; and in 2012-2013 step and lane raises were frozen but all staff members were given a “non-recurring payment of $2,750” to make up for it. Each year since the crash, total compensation has continued to rise at a rate far above inflation. 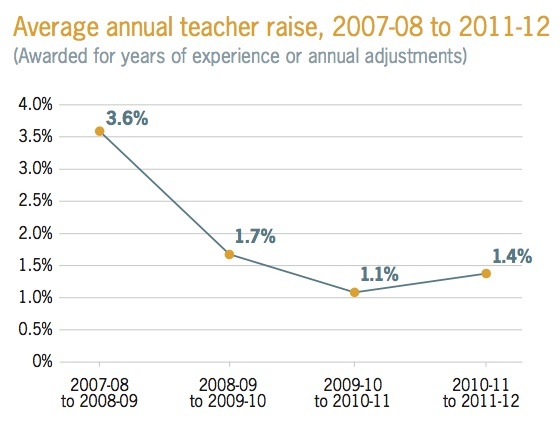 The increase in total compensation to teachers from 2011-2012 to 2012-2013 was 3.93%. The union has indeed made some concessions. But the Board of Education has made more. 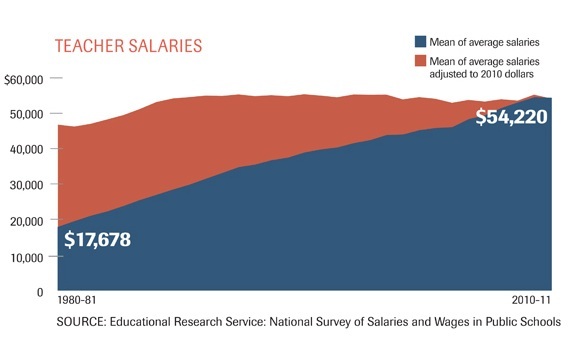 The chart below is a useful illustration of the fact that salary-schedule raises are only one of three raises teachers receive. When the salary schedule is frozen, compensation continues to rise at a rapid clip. A Nation at Risk: Where Are We Now? | Education Week | Published Online: April 23, 2013 | Published in Print: April 24, 2013, as Where Are We Now?